“There’s no ‘I’ in team, but there is in win.” — Michael Jordan, retired American basketball star. Those of us who gravitate toward leadership in business organizations — or create our own businesses as entrepreneurs — tend to be the independent sort. It seems ironic, then, that we achieve our highest levels of productivity only when we come together as teams. The fact remains that human beings are social creatures. We couldn’t have been otherwise and risen to become this planet’s dominant species. Nearly everything worthwhile we’ve achieved has come about as a result of team effort. Even those we often perceive as lone-wolf geniuses — people like Einstein, Mozart, and Da Vinci — worked in a collaborative milieu (e.g., science and music) or surrounded themselves with talented people they could trust. H.E. Luccock may have said it best when he pointed out, “No one can whistle a symphony. It takes an orchestra to play it.” Few people remember Luccock today, but in the mid-20th Century, he was an influential theologian and a shining light of the Methodist faith. He spent years at the Yale School of Divinity as a Professor of Homiletics, the art of preaching and writing sermons. He also wrote quite a few books about religion, surely one of the grandest team adventures in human history. By cooperating, teams achieve what individuals cannot. Indeed, this may represent the greatest advantage of teamwork. Making our own goals secondary to our group goals may seem difficult, but it pays off for everyone in the end. 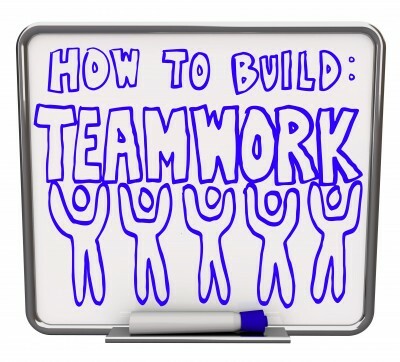 Need other reasons to instill effective teamwork as one of your team’s core values? While individuals can do separate pieces of a project in isolation and then wiggle those pieces together at the end, the process can prove to be more efficient (and effective) when the team works together closely throughout the process. Many tasks have no clear-cut edges, so when people work separately, significant overlap and duplication may occur. On a team where the members inform each other of their progress, you can more easily avoid this. Even in specialized fields, the constant evolution of knowledge and increase in information makes it impossible to know everything about the field. An archaeologist I know specializes in the very First Americans, for example; while he knows a little bit about all things archaeological, he would fail as an Egyptologist. Even as a First Americans researcher, he focuses on North America and has little knowledge of very early Central and South American cultures. The point is this: it would take a lot longer to complete a project if one person was required to know everything necessary to accomplish it. Instead, you put together subject matter experts on different aspects of the field and have them tackle the project as a group, leading to our next point. As the old saying goes, many hands make light work. This assumes you, as leader, make your desire for speed known and divide up the work in a manner appropriate to the team structure. If you tried to slog through something yourself, it could take hours over what someone else could do in 15 minutes. Deadlines motivate individual team members to work harder and invest greater amounts of their discretionary effort, thus buttressing and accelerating the process. In general, people don’t want to let others down. When one team member is sick or on vacation, another cross-trained team member can pick up the slack and still get the work done on time. If only one person is working on a project and holds the keys to the kingdom, it suffers until they return — and may even die in their absence. Even in projects that one person can handle, team efforts can increase the quality of output due to immediate feedback during the planning, design, and implementation stages. You might let one person manage the lion’s share of the administration, but the result is more robust with multiple perspectives. When you find yourself in regular contact with those who have different skill-sets, you can’t help but learn from them occasionally. Back when desktop computers were still fairly new — the ancient days of the early 1990s — a colleague of mine learned from a co-worker how to create a small program that automatically backed up his important files to a separate server every morning. It came in handy more than once. Have you accidentally picked up beneficial tips and tricks from your colleagues occasionally? If not, you’re not listening. Being part of a team encourages a sense of belonging, which often translates to greater sense of ownership and accountability for the work — especially when team members respect each other and don’t want to let the team down. Even if you disagree with a decision, you were part of the decision-making process, and you leave the room as a united front. Misery might love company, but so does jubilation. When you share experiences, you strengthen that sense of belonging and shared accountability that pushes you to excel. It may be fun to celebrate alone, but it’s always better when someone else celebrates with you, someone who knows where you’re coming from; and suffering alone is just demoralizing and depressing. A teammate can alleviate those lows — sometimes it’s nice to commiserate with someone who understands you. Teams may prove greater than the sum of their parts, in such a way that the results can be out of proportion to the number people involved. Consider Gilbert and Sullivan, Jobs and Wozniak, and Brin and Page. When most people think of teamwork, they think of sports first; but close collaboration is vital to human achievement at all levels, including business teams and society as a whole. In fact, teamwork stands as one of the chief hallmarks of human accomplishment — and may represent a prerequisite for civilization and human-level intelligence in the first place. Think about it: the greatest civilizations have always been those that encouraged or coerced a greater level of cooperation from their citizens, and the smartest animals we know — great apes, elephants, wolves, dolphins, and crows — tend to live together in cooperative groups. So encourage and take advantage of our tendency to work together for the good of all, even if you’d prefer your solitude, thank you very much. It’s basic human nature, and may be much easier to strengthen than you think. I invite you to share your team stories, good and bad, here in the comments. You just might provide some valuable insight that a fellow reader is looking for!